​EEI’s member companies—America’s investor-owned electric companies—partner every day with organized labor to advance the common goals of running well-managed, efficient businesses with a highly skilled workforce to deliver the energy that customers need. Leaders from the electric power industry and organized labor work together through the National Labor and Management Public Affairs Committee (LAMPAC), a joint effort of EEI and the International Brotherhood of Electrical Workers (IBEW), to foster collaboration and partnership and to address the nation’s energy challenges. National LAMPAC held its 12th annual meeting on March 11 in Washington, DC, which featured conversations on a range of critical industry topics, including advancing energy careers for veterans; energy grid modernization and collaboration; the reliability, resiliency, and security of the energy grid; the industry’s focus on safety and building the workforce of the future; and the role of emerging technology. U.S. Representatives LaMalfa and Schrader exemplified the spirit of the John D. Dingell Award through their collaboration and leadership on the Electricity Reliability and Forest Protection Act in the 115th Congress. Thanks to their combined efforts and close coordination, the bipartisan legislation was signed into law, and it improves the safety and reliability of the energy grid on federal lands. Under the law, electric companies now are able to remove hazardous trees before they become problems, which will help to reduce the threat of catastrophic wildfires and lessen the risk of widespread power outages. Learn more in EEI’s press release​. EEI and IBEW also presented the inaugural Edwin D. Hill Award to IBEW Local Union 396, IBEW Local Union 1245, and NV Energy, which worked together to form a diverse coalition to educate lawmakers in Nevada about their energy choices and about NV Energy’s plan for providing customers with more clean energy. The coalition included environmental organizations, small and large business owners, local officials, and other organizations dedicated to keeping energy prices low while increasing the amount of clean energy in Nevada. Customers in Nevada overwhelmingly agreed with the coalition when they voted last Election Day. Read more about the award in EEI’s press release​. Photo (L to R): American Electric Power Chairman, President, and CEO Nick Akins; Rep. Schrader; Rep. Dingell; Rep. LaMalfa; EEI President Tom Kuhn. ​As electric companies lead a profound transformation of America’s energy, they are working with other energy companies, their associations, contractors, and unions through the Center for Energy Workforce Development (CEWD) to build a skilled workforce pipeline that will meet future industry needs. These efforts were highlighted at a hearing of the U.S. House of Representatives Appropriations Subcommittee on Energy and Water Development, “Energy Workforce Opportunities and Challenges,” held March 7. Evans detailed CEWD’s numerous programs and initiatives to help build the future energy workforce, including the Get Into Energy resource website; Troops to Energy Jobs; the National Energy Education Network, a national consortium of educational institutions sponsored by CEWD industry members; State Energy Workforce Consortia; the industry’s partnership with organized labor; and more. She also gave examples of how Southern Company is partnering with CEWD and others to address its workforce needs through innovative programs like Alabama Power’s iCan, which boosts middle school girls into high school engineering programs, and Georgia Power’s FIRST (For Inspiration and Recognition of Science and Technology), which motivates young people to pursue education and career opportunities in science, technology, engineering, and math while building self-confidence, knowledge, and life skills. Read Evans’s testimony. Learn more​ about CEWD and the industry’s efforts to build the energy workforce of the future. ​Throughout March, EEI and our member companies are celebrating Women’s History Month by honoring the many extraordinary women who have helped lead, shape, and advance the electric power industry through science, technology, engineering, and mathematics. Read some of their stories in EEI’s latest Trailblazers series article on Delivering the Future​. ​“EEI and its member companies applaud President Trump's ongoing focus on protecting critical infrastructure, and we look forward to working with the Administration to ensure that industry and government continue to work closely together to protect the energy grid," said Scott Aaronson, EEI vice president of security and preparedness, after President Trump’s executive order, issued March 26, on Coordinating National Resilience to Electromagnetic Pulses (EMPs). “In 2005, Xcel Energy was the leading electric company provider of wind energy in the country, despite the fact that wind comprised only 3 percent of our generation. 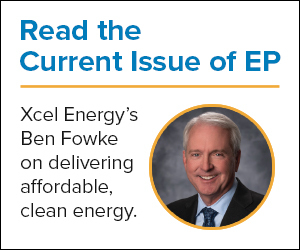 By 2022, when 11 wind farms now under construction are put into service, renewable energy—the vast majority being wind—will account for 46 percent of our mix and will be our largest source of energy for our customers,” Ben Fowke, EEI vice chairman and Xcel Energy chairman, president, and CEO, writes in the latest issue of Electric Perspectives. ​Americans are using electricity in more ways than ever, and our ever-increasing dependence on electricity underscores the vital importance of the energy grid. The report highlights the critical role of electric transmission in the energy grid; outlines the benefits transmission provides for electricity customers; offers case studies of electric companies’ transmission projects; and provides crucial data for policymakers and other key stakeholders as they make important decisions related to infrastructure, energy, and environmental policy. ​The Fortis Energy Exchange, held earlier this month in Toronto, gathered industry leaders from across North America to discuss the opportunities that lie ahead for the continent’s energy industry. EEI President Tom Kuhn delivered the event’s keynote speech: “We are excited and optimistic about the opportunities we have before us and are confident the transformation we are leading will deliver our energy future.” Kuhn said that EEI's member companies are committed to putting customers first, maintaining reliability, and keeping prices affordable for all customers. Kuhn also reviewed the close connections between U.S. and Canadian electric companies and their work to deliver more clean energy for customers, advance grid security, and partner through the electric power industry’s mutual assistance networks: “There’s no better way to see the North American electric power industry partnership in action than to look at our companies’ response to severe weather and other disasters. Whenever called upon, workers from U.S. and Canadian electric companies work hand in hand, literally standing shoulder to shoulder, to restore power for customers,” he said. The Fortis Energy Exchange was held in partnership with EEI, the Canadian Electricity Association, American Gas Association, and Canadian Gas Association. ​Electric companies are committed to helping customers save energy and money, and their energy efficiency programs are resulting in savings on a massive scale: 198 terawatt-hours (TWh) of electricity in 2017, up from 183 TWh in 2016. That’s enough electricity to power 22 million U.S. homes for one year. The report also offers a state-by-state breakdown of the regulatory frameworks that support electric company investments in energy efficiency. ​Electric companies are committed to creating a smarter energy future that benefits all customers and communities, and every day they are working to create the innovative solutions their customers expect. To provide its customers with critical safety messages and to keep them informed about weather events impacting their communities in Texas, Oncor has launched an innovative weather information service called Weather Current, to be featured across its website and social media channels. Each Weather Current forecast includes helpful tips and advice to educate Texans on the importance of safety around power lines and electrical equipment, as well as helpful information to guard against potential storm hazards. The forecasts are hosted by Jen Myers, an American Meteorological Society-certified expert, and initially will appear on Mondays and Fridays and during periods of extreme weather. Watch the latest forecast on Oncor’s Facebook page. An earlier version of this story appeared on Oncor’s website, The Wire​. 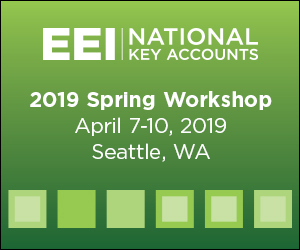 ​“Ensuring the security of North America’s energy grid requires an ongoing commitment to information sharing and collaboration between industry, government, and interdependent infrastructure sectors. At the North American Electric Reliability Corporation (NERC), the Electricity Information Sharing and Analysis Center (E-ISAC) plays an important role in that collaboration and is focused on supporting our members in the electric power industry,” NERC President and CEO Jim Robb writes in the latest issue of Electric Perspectives. ​In addition to our U.S. member companies, EEI has more than 65 international electric companies, with operations in more than 90 countries, as International Members. EEI International Programs provides members in the global electric power industry an agile and efficient platform for collaboration, dialogue, outreach, and leadership, and delivers high-quality, relevant information and services that enhance the capacity of EEI members to realize their commitments to building affordable, reliable, resilient, and sustainable energy systems of the future. Learn about the many member benefits offered by EEI International Programs in its latest annual report. Find additional resources on our website​.